Today is World Environment Day 2018. Despite how alarming environmental issues are, and so often ignored, it is heartening that World Environment Day 2018 is highlighting growing efforts worldwide to #beatPlasticPollution. You may have been aware of campaigns against plastic springing up worldwide. Inconceivable and exponentially increasing amounts of non-biodegradable plastic is dumped in our rivers and oceans, inflicting great harm to seabirds and marine wildlife. Shocking images from documentary filmmakers and photographers of huge floating islands of trash have spread on social media and have ignited public concern, to which our governments are now beginning to address. There is a lot to do. It feels similar to how social media platforms have helped propel awareness about the similar plight of bees worldwide. I’ve been intrigued that plastic has ignited such a grassroots response for action, compared to how unprecendent mass species extinction, and climate change are much graver concerns. However, they are all caused by the unsustainability of industrial culture. Perhaps because plastic is so tangible and part of our everyday lives, we can’t but not notice it on our doorstep, and everytime we go shopping. And like ocean-dwellers, we all need to drink pure water too! Some of the key images that have caught our hearts about plastic pollution have been the result of some tireless individuals, who with artistic skill, have shown us the effectis of the throw-away-and-forget horror of our modern way of life. I’m sharing news that in a few days, a lead artist against pollution, photographer Chris Jordan, whose images early on (since 2008) impressed initial horror and grief on the state of our oceans, is releasing his feature length film Albatross free to the world, on World Ocean’s Day June 8, 2018. 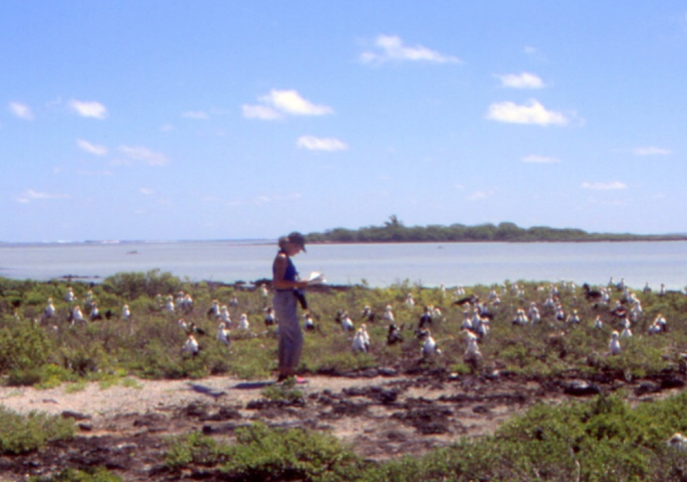 I once counted seabirds on a remote South Pacific atoll (and made a short video of the experience). Suwarrow atoll is now threatened with plastic and rising, warming seas and in my video I relate my work for permanent forests as responding to global environmental concerns. Some of the scenes in Chris’ trailer are so similar to the abundant and beautiful seabirds I encountered; getting close to wildlife a few feet away; the beauty and noise of the birds. Thank you Chris and your team for all the work you do! There is much untapped power for the arts to engage us with the calamities science has been detailing but which have been hard to communicate. Do feel free to share this post, for all seabirds and for all of us! We are all connected. Hi Cathy , am wondering how you see the role and challenges of painting as a dicipline in a contemporary eco art practice? I know its a big question, but any thoughts welcome. Thanks for your important question and it is a big one. Some of this you will know already I suspect, but I hope it might help or situate more clearly how I and other ecological art practitioners work. In modernism, art is seen apart from society, individual talent is prized and prioritised; the phrase “art for art’s sake” describes this view. The autonomy of art is seen as a measure to prevent it being used for propaganda or instrumentalism (an important point considering how art has been mobilised for political turmoil in the last century). For e.g. art critic Claire Bishop supports this view, but increasingly others have debated that art remaining autonomous is hard to maintain when industrial society is on the point of environmental collapse and social injustice and inequality are increasing, now and for future generations. I subscribe to the latter view, and my previous background in science, has, of course, coloured my views that art education must focus urgently on equipping all in the arts with a basic ecoliteracy. My research has helped me think about how the ecological emergencies we face are a crisis of Western, globalised industrial culture; so cultural responses will be crucial to help society more to live in more life-sustaining ways. In my art education, I too started out in painting (life drawing was a particular passion) but over time, my understanding of industrial society’s urgent need to move toward an ecological age, challenged my views of modern art practice. Briefly, (I will be shortly publishing my doctoral work on a guiding theory-method framework for long-term ecological art practice, what I call ‘eco-social art practice’), an ecological worldview, challenges my earlier ideas of art-making as a solitary endeavour and relegated to only those that society regard as talented. I now see artistic skills as one critical part of an ecological art practice: for me, my artistic skills help translates the specific places and their inhabitants anew (I tend to use photography and video now) but it is just one stage in developing ecoliteracy for myself and my audiences. I also don’t see myself as an artist per se, but part of a network of others, in my case, evolving a new conversation of permanent forestry in Ireland. My work remains highly creative and is tethered to repeatedly questioning how I can improve my relationship to the forest I live with, which also speaks to ideas of how we need to change forestry worldwide – it is an eco-social-art practice as to move society forward we need to engage social practice alongside environmental knowledge and of course employ creativity to rethink unsustainable activity and to reach others in engaging ways (science alone will not motivate us to change). Specifically, I find a practice that allows me to cross disciplines, that is an ongoing residency of where and how I live in this place, that is flexible and fluid enough to invite other art and non-art ways of knowing together, somehow resembles an ecological way of being… I frame my methodology for the work I do now under action research, athough I have read widely (Thich Nhat Hahn’s ‘The world we have’; Love Letters to the earth’, Joanna Macy and Derrick Jensen’s work have all being helpful). Thank you for asking me this, always good to clarify one’s development. Thanks Helen, do direct your questions to my email.